Just to explain: the run dialog called by Alt+F2 is a function of Gnome Panel, that is not running in Unity (it uses its own panel), so we'll have to wait for them to implement such functionality. One workaround is to install the package 'gmrun', then use the "Add" button in gnome-keybinding-properties to create a new action with the command 'gmrun'. This can then be bound to Alt+F2. gmrun, however, has reduced functionality compared to the Gnome Panel run dialog. Other alternatives - GnomeDo, Kupfer. Very lightweight - Lauf. And again we end users are left asking why a product that is not ready for prime time, and has fewer features is replacing existing functionality? Especially this time when the old functionality was simply taken away abruptly. Unity is definitely much better than Lucid's default UNE desktop. Definitely my no.1 problem with Unity right now. This is on the list for Natty. For me, the fix suggested in #3 works very well. This could even be the fix for Natty: gmrun seems very nice, and while very simple there are some nice features --- remembering history, auto-completion, and the fact that ctrl-enter runs it in a terminal I think is actually nicer than the gnome panel Alt-F2 where you have to move back to the mouse and click a checkbox. And it's very light. Enable the gnomecompat plugin in the default config and you'll get it back. No really Sam, we will need to add a custom application for that. indeed, alt + F2 app is part of gnome-panel IIRC, that we won't launch with unity. So, keybinding by default + dedicated app will be needed. a) It isn't a 'fix' it's a 'workaround'. New user has to search the web for an answer or reported bugs. b) This is a no go regarding the mission 'user-friendly', since system preferences -> shortcuts state the shortcut is Alt+F2 (screenshot), btw. Alt+F1 also doesn't run. GnomeDo doesn't work too, if you press <SUPER>+<SPACE> nothing happens. Assigning to Didier since gmrun can be integrated as a replacement. Its similar to Gnome-Do but with more active development (many of the developers of Synapse previously worked on Gnome-do). It might not be as lightweight as gmrun, but it has many features, such as Zeitgeist integration. At the moment developers have chosen to go with gmrun since it is a simple application to run executable files. It will be basically like the run dialog from gnome-panel, but a stand-alone alternative. While your suggestion is appreciated, for now, at least, I think it is best to make a decision and stick with it. I for one, am in favor of continuing on the gmrun path. Rather, it *was* a regression in Maverick. Hey guys new here but just a thought as I am stumbling around on a few bumps and hurdles, does ctrl-F2 not get it done? I was trying to get Natty Unity working on my ATI HD 4200 with no luck and found that ctrl-F2 gave me a sort of same runbox as Mavrick did using ALT-F2. Confirm if CTRL+F2 gives you the run box you are looking for. It works for me and I don't believe that anything extra has enabled this feature as it was done on a fresh install. Please test for confirmation. Ctrl+F2 isn't doing it for me. Fresh install, but admittedly I've made my environment less stable by building and installing some stuff from upstream. ;-) Anyhoo, I'm eager to know what is producing Sam's 'run box.' Thanks! It is fast(Vala written) and works with Zeithgeist. This definitely is a problem that needs to be solved. But I am wondering: Why go through all the trouble and introduce a new program when the perfect solution is already there? In unity we already have a wonderful application launcher: The applications lense in the dash. Would linking Alt-F2 to this lense not serve exactly the same purpose while avoiding an extra program? There might be some adjustments necessary, but these seem only minor. There already is instant searching for example. The only thing I can think of is easy keyboard navigation through the proposed applications and launching the program by pressing the return key. that the traditional alt-f2 also allows things like "run in terminal"
Would adding a "[ ] Run in terminal" checkbox below Run box fix that? FWIW, from my perspective the "run in terminal" option is NOT a must-have. I use the traditional alt-f2 constantly, and I have for years. And in all that time I think I opted to run something in the terminal once. If something must be run in the terminal, which I do quite often, I typically use alt-f2 to launch gnome-terminal or xterm if I don't have a terminal already running. Thus if the choices are create a special Unity clone of the traditional run app dialog or just bind alt-f2 to something you already have which already provides the desired functionality, my vote as a user would be just bind the thing so we can use it. The traditional Alt+F2 also allows the user to run any command he/she could run in a terminal, not only to launch registered applications. My opinion is that we should be using Alt-F2 should bring up the classic "Run Application" dialog. I see this as an important backup way to start applications should the dock/launcher or other parts of unity not work as expected or crash unexpectedly. Currently I use Ctrl-Alt-t as "Alt-F2" (thanks to Mark for the tip, I was pulling my hair out before). Doing Ctrl-Alt-t lots also means you end up with a lot of Terminals left around, and those Terminals are hard to reuse with broken Alt-Tab (bug #175874) and then all looking the same in the switcher. Personally, I can't recall having used the "Run in Terminal" option in perhaps more than once (and then only as an experiment to see what it did) so I don't know that we need to provide it; there have to be better ways based on heuristics (program writing to stdout, stderr, or blocking on stdin). However, I'd be tempted to provide an Alt-F2 with "Run in Terminal" *in the short term* to improve the "familiarity" that a pre-existing user feels when confronted with the new Unity interface, going some way to helping to put them back in their comfort zone. I think the dash way is the best.. i did expect it to run commands that i enter anyway until i understood that it's just a search box.. Adding this functionality wouldn't break any existing one or create usability issues imho..
the only negative aspect is that when unity crashes Alt+F2 does exactly nothing which is quite annoying.. but that was the same with the traditional Alt+F2 anyway..
Chromium has this neat 'quick search' feature that enables the user to search a specific topic by typing 'keyword' + 'space' + 'search input'. The same could be done with Unity dash, e.g. type 'l update-manager' ('l' for 'launch') to run 'update-manage' as when you pressed Alt-F2 in the old days. To get a better idea of what I mean, look at the mock-up. A similar type of 'specified search terminology' is already used by Firefox, Chrome and DuckDuckGo in form of '!Bang' keywords. As the Alt-F2 feature is used mostly by advanced users, I think previous Alt-F2 users would quickly adopt the new procedure. Spotlight for an example of good usability. difficult to achieve with Unity than with the classic Gnome UI. Please stop adding new implementation suggestions. 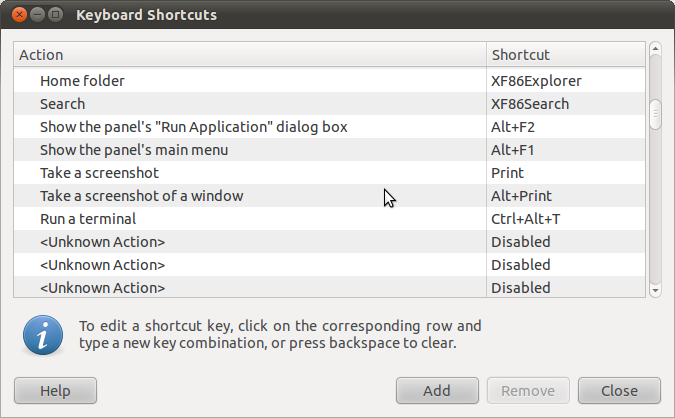 According to https://wiki.ubuntu.com/Unity/KeyboardShortcuts , Alt+F2 will "Invoke the Dash in a "special mode" to run a command". @David: The original Alt+F2 launcher is part of Gnome's panels which Unity doesn't use as explained in comment 1.
massive improvements before the release of Natty. > the Dash in a "special mode" to run a command". > Unity doesn't use as explained in comment 1. @David: I haven't written that wiki page. While testing natty, the dash, unity sidebar, panel and compiz crash. Not having a simple alt-f2 run dialog forces me to reboot. Feature freeze exception granted for this, as this is a regression. - [dash] Newly installed applications are not shown in the "Installed"
This bug is still not fixed in 3.6.4-0ubuntu1. Pressing Alt+F2 works, but I can't start anything from there. I can second, that the bug is not fixed. You still have to manually select the command in the result, even if there is just one result. Hitting the enter key should automatically execute the currently highlightet result. Furthermore, if you selected the command by yourself it will be executet the next time you use alt-f2 even if you type in something completely different (without selecting something from the new resultset). You need latest places update and to restart unity to get a working alt-f2. - press enter -> gcalctool (the first item in the results) is launched. The other items are available on key navigation. > of a duplicate bug (728989). > > of a duplicate bug (728989). This is obviously not fixed in Unity 2D. I have never seen Alt+F2 in Unity 2D doing anything so far, including current iso testing images. I just installed unity-2d on this netbook running (fully updated) 11.04 natty and Alt-F2 works properly as it does under regular unity. I did some further testing, with the result that Alt+F2 works _sometimes_, but not always. For example, when I boot into daily live images 20110803.1 (both amd64 and i386), Alt+F2 does nothing, no matter how often I press the combination. It also didn't work on my fresh installation yesterday. But when I booted again tommorow into the same fresh installation, suddenly Alt+F2 worked! I thought it could be related to installing the propritary Nvidia driver. But it continued working when I removed the Nvidia driver (yes, all tests were done under Unity 2D. Never seen the problem with the Compiz-based Unity so far.). So the next step would be to find out what stops Alt+F2 from working sometimes, but I honestly have no clue how to find out. But I would gladly do further testing if somebody has an idea. > natty and Alt-F2 works properly as it does under regular unity. > duplicate bug report (728989). @Jan -- since you mentioned "daily build" I presume you are booting images of 11.10 "Oneric Ocelot" and not 11.04 "Natty Narwhal." Since this bug was closed in 11.04 "Natty" you are probably seeing a different issue and you will want to open a new bug against Oneric. No. Anyway, this bug is fixed on Natty final. > issue and you will want to open a new bug against Oneric.